FANTASTIC 14 - We reflect on all the action we have seen during the last twelve months. 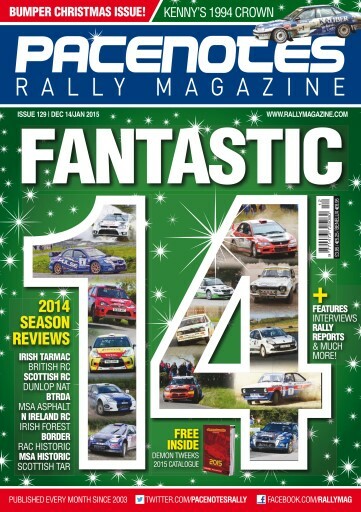 This mega issue contains no less than 12 Championship Reviews as well as 13 Rally Reports, along with a special interview with Double Irish Champions Declan and Brian Boyle. Martin Holmes gives us his thoughts from the recent Wales Rally GB. We also have our full report on the final round of this years World Championship along with the full National Rally event. We have fantastic Retro article from Kevin O’Driscoll who looks back at the 1994 Irish Tarmac Season, when Kenny McKinstry was crowned king. Don’t forget we have some great ideas for Christmas in our Gift Guide. 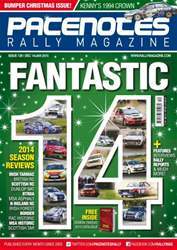 There is a lot to keep you entertained in this double issue, all that remains is for everyone here at Pacenotes Rally Magazine to wish you all a very Merry Christmas and a Happy New Year.